Off and On for years, I have seen the image above in my mind so I decided to find it. It's called Chi Rho (pronounced 'Cairo') and means Christ. Lately I see it with a wreath around it - which symbolizes the victory of the Resurrection or Alpha and Omega. In the Book of Revelation, it reads "I am the Alpha and Omega, the first and the last", "the beginning and the end". This would be similar to referring to someone in English as the "A and Z". The Chi Rho symbol has been found embedded in many works of art depicting the journey of humanity and often linked to an alien source of creation and secret societies that may or may not still exit today. It's always about numbers, angles, and degrees. It will always go back to Z as Thoth the Scribe and his original script of our journey here from which all else emerged in time. Chi Rho is one of the earliest cruciform symbols used by Christians. Chi and Rho are the first two letters in the Greek spelling of the word Christ and so have come to be used for a number of Christian-related usages. Chi Rho is formed by superimposing the first two letters of the word "Christ" in Greek, chi = ch and rho = r. Although not technically a cross, the Chi Rho invokes the crucifixion of Jesus as well as symbolizing his status as the Christ. 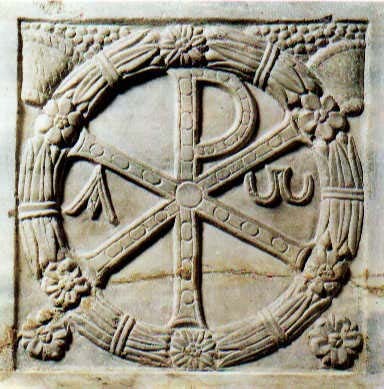 Chi Rho in Latin is Labarum. Chi Rho in a circle ... the end of the program, full circle, infinity, etc. 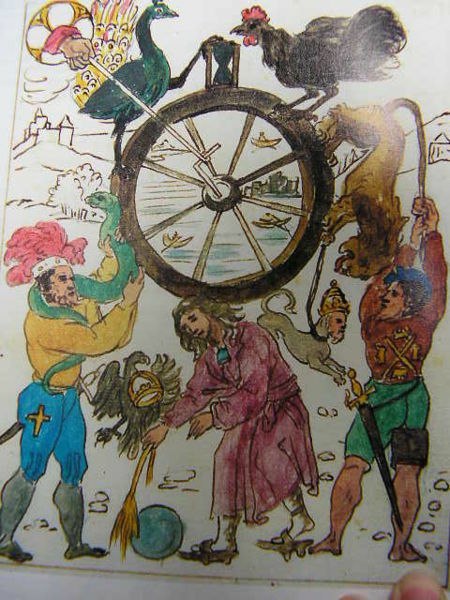 What now comes to mind is this water color image from the Lost Book of Nostradamus. In 2007, I spent a week studying these images (referred to as plates), before doing the History Channel Show of the same name, and always returned to this image (plate) as holding the key. There are endless metaphors encoded within this image. The 7 Spoke Cycle/Wheel of Time and Karma moves to 8 ... infinity ... as yet unwritten. The wheel of time and karma comes to a halt by the hand of God, the 7 reversed, the hourglass empty, the tale of the lion complete. The emotional burdens of time will now be released from the back of the man dressed in red (emotions, the physical plane). The peacock goes to ascension through the eye at the center of the Milky Way Galaxy. Creation above, the old below. While doing the TV show, I didn't feel that Nostradamus drew the images, nor guided his son to draw them, yet some attribute them to Nostradamus for a reason dictated by the program. Some believe the origin of the work is the fourteenth century Vaticinia de Summis Pontificibus, a series of manuscript prophecies concerning the Papacy. This takes us to the Prophecy of the Popes. If you go to the bottom of St. Malachy's "Prediction List of Popes", you will be amazed. He names them all in order, mentioning Benedict XVI as the next to the last Pope, the final one unknown, if there ever is another Pope. The End. Consciousness is often thought of as Creation or God or Father, mentioned now as Sunday we celebrate Father's Day. I've blogged a lot about the relationship of fathers and their children which goes deeply into one's genetic predisposition for experience, the need to overcome issues and "wounds" from the past that one is dealing with today. Fathers are rarely perfect having their own programming to fulfill. 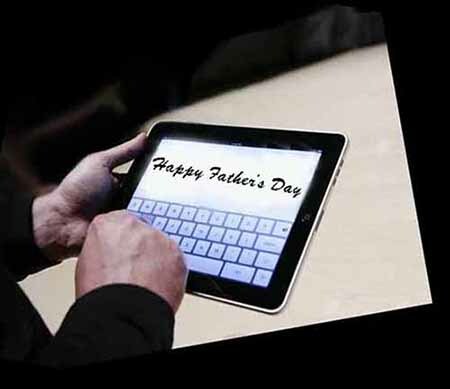 In 2011 we thank the fathers, and pseudo-fathers for anything positive they bring to make our journeys a safer, better experience. The message comes Out of the Blue then Fades to Black. At the end of the day (reality) - it's all connected and the same message.